The ELO Encounter returned to Birmingham to make their debut at The Crescent Theatre on Saturday night (16th June) and proceeded to prove their growing pedigree by overcoming first half sound difficulties to deliver another inspired selection of Jeff Lynne penned ELO classics (*plus one by Chuck Berry) in front of an appreciative "Down Home Town" audience. 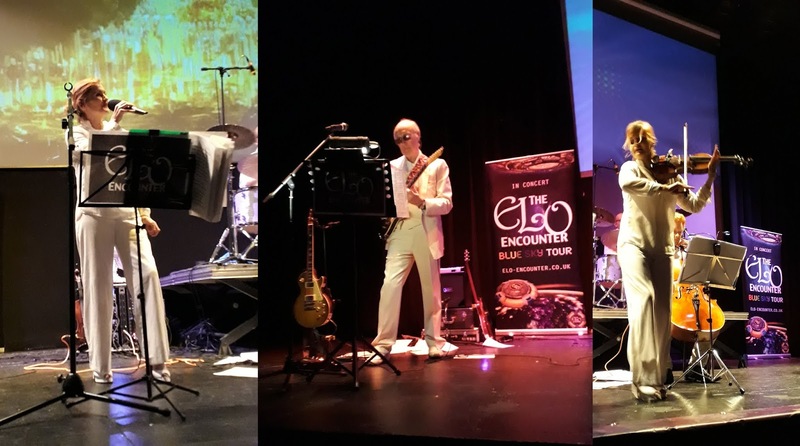 Despite the vocals of Jack Rownes being somewhat muted at first, this gig demonstrated the progress that the band has made in "Steppin' Out" at larger venues whilst they continue dipping into the ELO songbook to bring the lesser known singles to the stage. Thirty songs were played including (quite aptly) all three UK singles taken from "Secret Messages" including the title track (perfectly in sync with the official video) and a nice rendition of "Four Little Diamonds". It was great to hear "Nightrider" and "Here Is The News" again as an expansive set covered the chart career of (the) Electric Light Orchestra all the way from "10538 Overture" to a welcome "Calling America". 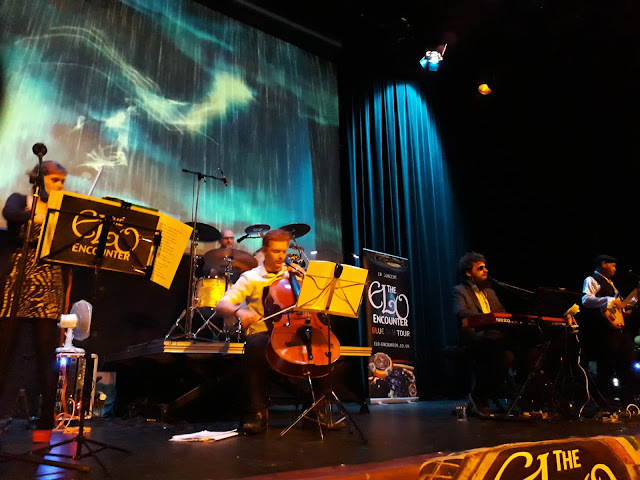 All the headline hits were on show too as you'd expect with a rousing "Roll Over Beethoven" and "Mr. Blue Sky" getting most onlookers up on their feet. Special mentions are due for Jasmine Ali (who managed to sing a peerless "Xanadu" with a sore throat) and last minute cellist Aaron Billson but this really was a team effort with guitarist Martin Donald, new drummer Dacre Peck, bassist Simon Rownes and son Jack combining to produce what was, in the end, a thoroughly enjoyable evening. 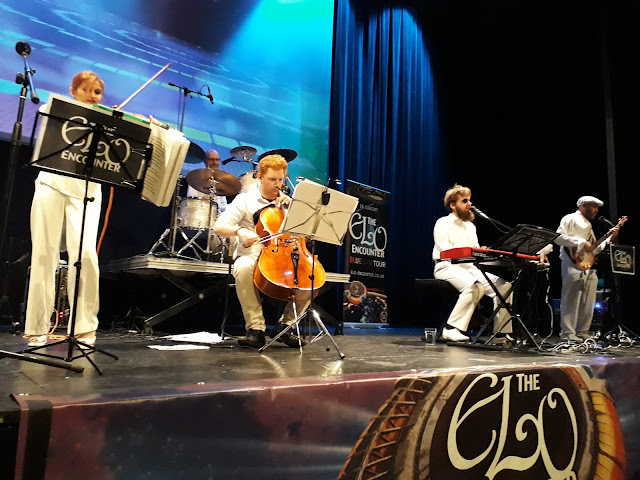 The ELO Encounter performed: "Standin' In The Rain" ~ "Evil Woman" ~ "Showdown" ~ "Strange Magic" ~ "Secret Messages" ~ "Prologue/Twilight" ~ "Here Is The News" ~ "Rock 'n' Roll Is King" ~ "10538 Overture" ~ "Livin' Thing" ~ "Can't Get It Out Of My Head" ~ "Ma Ma Ma Belle" ~ "Nightrider" ~ "Telephone Line" ~ "Don't Bring Me Down" +++ "Tightrope" ~ "Sweet Talkin' Woman" ~ "Four Little Diamonds" ~ "Do Ya" ~ "Rockaria!" ~ "Hold On Tight" ~ "Roll Over Beethoven" ~ "Turn To Stone" ~ "Calling America" ~ "The Diary Of Horace Wimp" ~ "Xanadu" ~ "All Over The World" ~ "Last Train To London" ~ "Shine A Little Love" ~ "Mr. Blue Sky"
Thanks very much Keith and lovely to see you and your wife. Thanks for bearing with the sound issues in the first half.